Everybody complained when the new Toyota Supra debuted with an engine sourced from BMW. It was “wrong”, it should have been a successor to the last-gen’s famous 2JZ, they all cried. Well, after somebody finally listened to all of the complaining and installed a vintage 2JZ in his own new A90 Supra, it turns out it probably wasn’t meant to be. The swap was performed by legendary drifter Daigo Saito, who is no stranger to the famous engine, or to drifting. While the car looks pretty well built, it obviously still needs some tweaking. 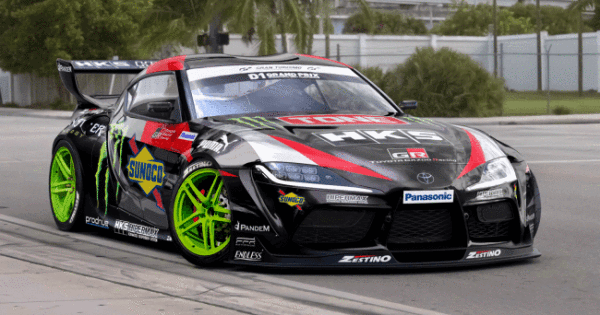 We’re judging by the fact it, y’know set itself on fire a couple times while performing at the “Monster Energy Presents D1GP All-Star Shoot-out” in Odaiba, Japan. The first time flames were emitted from the MK5 was in the pits of the event, as captured by Instagram user Verkeenko. The car’s exhaust doesn’t seem to route completely outside the bodywork, which caused a problem when flames started spitting from it, prompting a panicked scramble to find a fire extinguisher. Daigo would have been fine if that was his only problem, but it seems like it was a sign of things to come. Later on the track, the MK5 Supra decided to catch fire from the business end. “Still a few teething-troubles for Daigo’s new Supra,” says Noriyaro, who captured the fire on a camera we can only assume is made out of a can of beans. The damage doesn’t look good, but hopefully, it was just a small blaze and the team figured out the fire extinguisher faster this time around. The car seems to work pretty well when it isn’t on fire, as this last clip shows, despite the little spin at the end there.